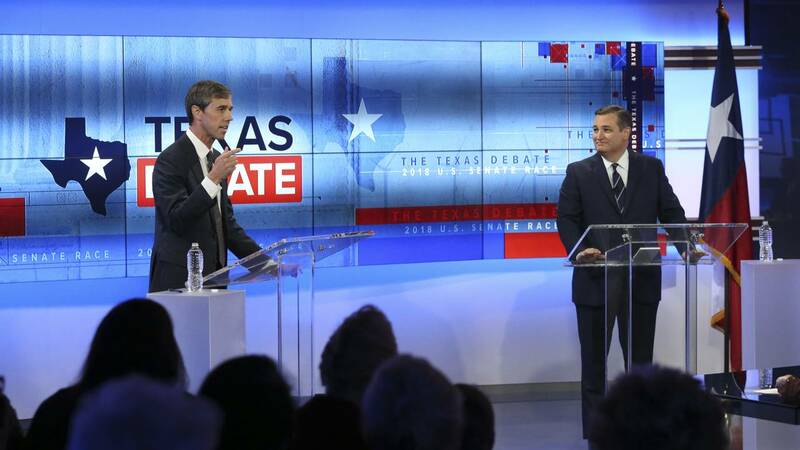 U.S. Rep. Beto O'Rourke (D-Texas) and U.S. Sen. Ted Cruz (R-Texas) face off in a debate at the KENS 5 studios on Oct. 16, 2018, in San Antonio, Texas. (CNN) - Rep. Beto O'Rourke has spent more on Facebook ads than any other candidate this campaign cycle, new data released by the social media company Tuesday shows. The Texas Democrat's campaign has spent $5.3 million since May. The campaign of his opponent, incumbent Sen. Ted Cruz, has spent just over $400,000 on Facebook ads in the same period -- less than 10% of O'Rourke's expenditure. In one week, between October 14 and October 20, O'Rourke's campaign spent more than $500,000 on the platform. Also, according to Facebook, almost $5 million has been spent running ads on President Donald Trump's main Facebook page, "Donald J. Trump." Since May, more than 100,000 ads have been run on Trump's page, according to the company. Some of them were paid for by The Trump Make America Great Again Committee and others by Donald J. Trump for President Inc., according to Facebook. The Democratic National Committee and the Republican National Committee have spent $401,770 and $328,016, respectively, on the platform since May. Also among the top spenders is the oil company Exxon Mobil, which has spent almost $2 million on ads on Facebook since May. Many of the company's ads qualify as relating to "issues of national importance." Exxon Mobil has been running ads in opposition to a ballot measure in Colorado. Proposition 112 would set minimum distance requirements for new gas and oil projects. Facebook released the data through its new "Ad Archive Report" tool on Wednesday. The company has brought in new rules for political ad-buyers in light of the 2016 election campaign, when Russian operatives targeted Americans with political ads. The company now requires political and issue-based ad buyers to provide picture ID and Social Security information. Since May, more than a quarter of a billion dollars has been spent on ads relating to "politics and issues of national importance" on Facebook, according to the company.